In the autumn of 1962, Professor Gyokurin visited the Bay area and held workshops demonstrating shoka sanshuike and other new lkenobo concepts and friends that were evolving in Japan. His workshops generated great enthusiasm among the teachers who attended. With his encouragement, the Northern California Chapter was officially founded on January 18, 1963. The Northern California Chapter was the second international Chapter approved by Headmaster Sen’ei Ikenobo. Professor Ito and many dedicated Issei Ikenobo teachers were responsible for sowing the seeds of Ikebana in Northern California. They continue to nurture the art of Ikenobo as we enjoy it today. 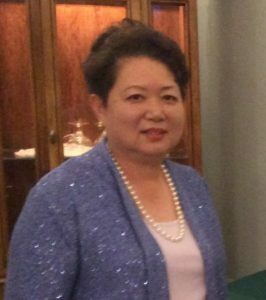 The founding Chapter President was Mrs. Yoshino Nomura. She was instrumental in teaching lkenobo to students in America. She held the first executive meeting in Oakland to plan for the future of the Chapter. During that meeting, it was decided to locate the Chapter office in San Francisco. Seven Chapter presidents succeeded Mrs. Nomura: Hoka Nishimi, Hoju Kitagawa, Murayo Sawai, Chizu Iwata. Hideko Metaxas, Yoshiko LeSage and Mitsuyo Tao. The Chapter’s first flower arrangement exhibition was held in the Hall of Flowers, Golden Gate Park in September 1964. To expand lkebana, subsequent exhibitions were held in neighboring areas including Sacramento, Oakland, San Mateo and Stockton. In February 1968, the lkenobo lkebana Society of San Francisco office was opened. 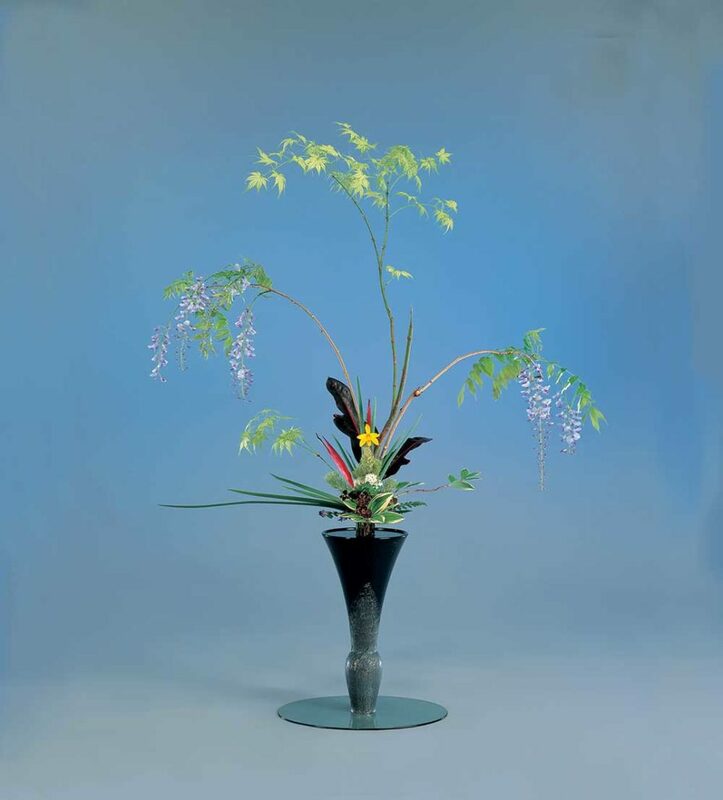 The name was officially changed to the lkenobo Ikebana Society of America in 1978. Since the establishment of this their students have displayed arrangements in the headquarters windows year round. This collaboration built lasting friendships and provided the per­fect opportunity to promote both lkenobo lkebana and our Chapter activities. Since 1968, Visiting Professors have been sent from the lkenobo Headquarters Kyoto to teach across North America. Workshops and demonstrations are held in Golden Gate Park and in areas across Northern California. The visiting Professors have been self named “Kiri no kai.” This name symbolizes their high ranking Ikenobo levels and it can be translated as “Foggy Club” symbolizing the spectacular fog they experience upon arriving at the Headquarters in San Francisco. In 1977, the Ikenobo Ikebana Society of America co-sponsored its first study tour to the lkenobo Headquarters in Kyoto Japan. The study tour was implemented to advance the study of lkenobo lkebana for students in North America and throughout the world. The study tour is offered once every four years. The 11th study tour was hosted in 2016. Since 1978 bi-annual exhibitions have been held in the Hall of Flowers in Golden Gate Park, San Francisco. During this event, there is a workshop for “C” class students in the morning and a demonstration by the visiting Professor in the afternoon. There is also a plant and vase sale. This tradition continues today. As the Issei sensei in the Northern California Chapter began to advance in age, they recognized the necessity of mentoring younger Ikebana teachers. In 2006 they individually donated to create the Northern California scholarship fund. The scholarship provides funding to send individuals for independent study at the Headquarters in Kyoto Japan. The first and second scholarships were awarded to Sandra Hatcher and Mayumi Johnson in 2006. The third scholarship was awarded to Chimiyo Shioya in 2011. Northern California is the only Chapter to have a scholarship program. Our Chapter hosts social events throughout the year including our annual New Year’s celebration and our summer program. Over the last 50 years our chapter has progressed as new styles have been introduced and new concepts evolve. We continue to work actively to continue the art and spirit of lkenobo throughout Northern California.